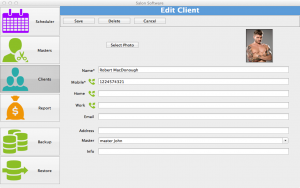 Salon Software for Mac is a program designed specifically to be used on Mac (OS X) serving as a management efficiency partner to all kinds of salons. These include hair salons, fitness studios, tattoo salons, tanning centers, fashion shops, wedding salons, beauty centers, ateliers, makeup artists, aestheticians, manicurists and all other expert services that are offered in the field of health, fitness and beauty care. The program can efficiently be used by both individuals such as makeup artists or fitness experts and also by owners of salons who can use it to manage all activities taking place in their salon business. The program offers a simple and easy to use interface, allowing users to effortlessly use the program to their benefit. 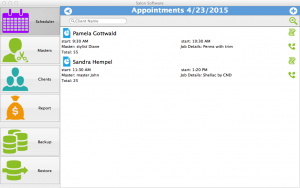 The main menu offers four icons Masters, Clients, Reports and Scheduler. In the Masters section, profiles can be created of all the specialists working in a salon listing their name and specialized job title. 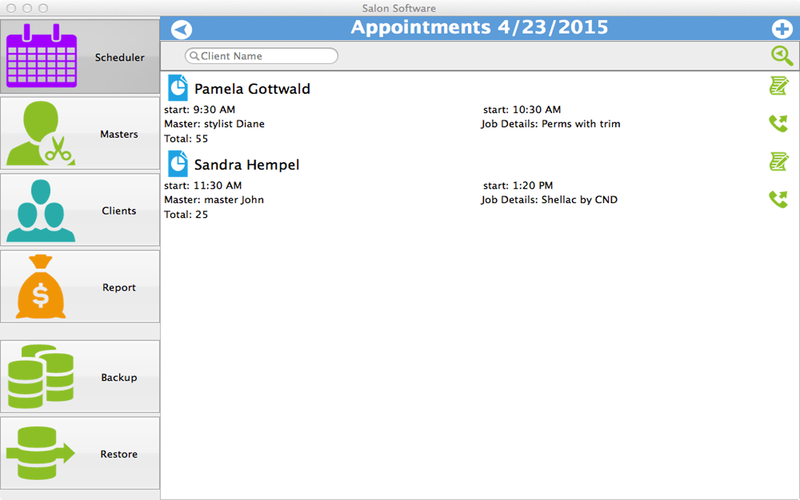 This makes it easy for the manager or owner to search the right person for a job and check his availability to create new appointments. The Clients section similarly holds all information about a salon’s clients including name, address, email, phone numbers and even their photos. This record is valuable for referring to whenever the need arises. 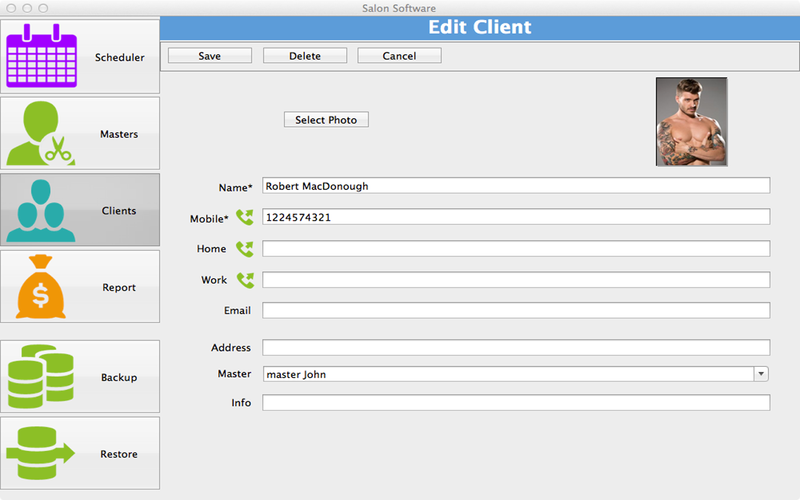 The photo capture option allows the user to capture photos of both the Clients and the Masters to be saved with their profiles for record purposes. 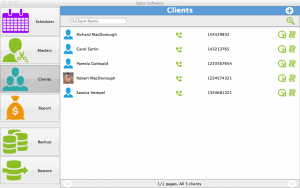 Also the program offers the provision of making direct phone calls from the numbers saved, besides offering the option of calling directly to the Skype IDs of clients as well. The Reports section shows the details of finances earned by every expert on a daily basis. 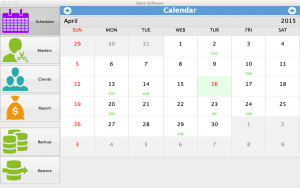 You can check earnings based on every individual or calculate accumulated daily earnings of the salon as well. 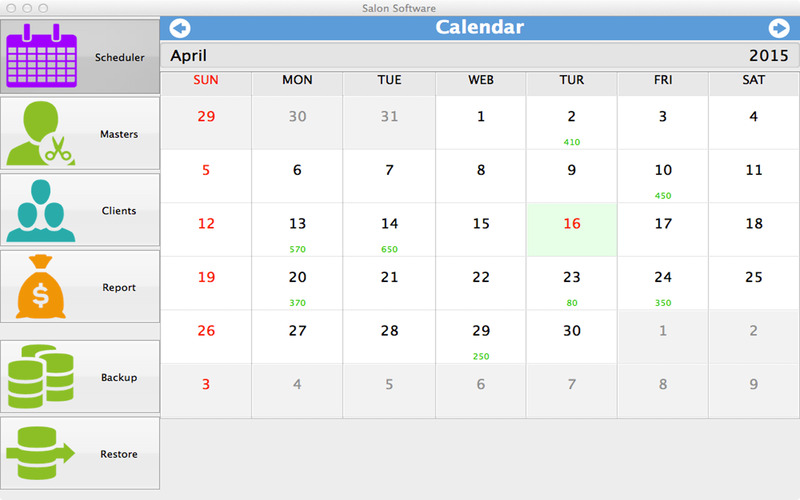 The Scheduler is available in form of a calendar which shows daily total earnings on the top corner of every date. There are a myriad of information that can be viewed through the scheduler including daily appointments, details of job, total earning from each job, etc. Also through viewing and checking this calendar new appointments can be made on free slots. You can also save in special comments or requests of a client related to the job for future reference. Another beneficial feature of the program is that it also offers Restore and Backup Options. Now you can ensure that your precious Mac database information is secure by making the program compatible with Android and Windows phone versions as well. You can restore your database on other versions by installing programs that are available from respective stores.